I am starting to get caught up again with my BOM sewing. I started with Amy Gibson's August block. At least, I tried to. Here is Amy's block. Sticking with my blues and cream/tan colour scheme, I used one blue batik and two cream backgrounds. Do you see my mistake? Somehow I didn't notice that I had all four corner pieces turned the wrong way, a mistake that completely changes the look of the block. Gone is the plus shape, and in its place I have a square. Fortunately, I like the new look, so I'm leaving it as is. I am probably going to make another version sometime, following the pattern properly, of course! For this pattern, all 20 HST units were made slightly bigger than needed, then trimmed to size. I will admit I found the trimming to be incredibly tedious, but it sure does produce accurate results. I've never seen so many perfect points in one of my blocks. Tedious, but worth it. I have all the pieces cut for the July block as well, so hopefully I'll get that stitched up soon. I love how these blocks are looking so far. 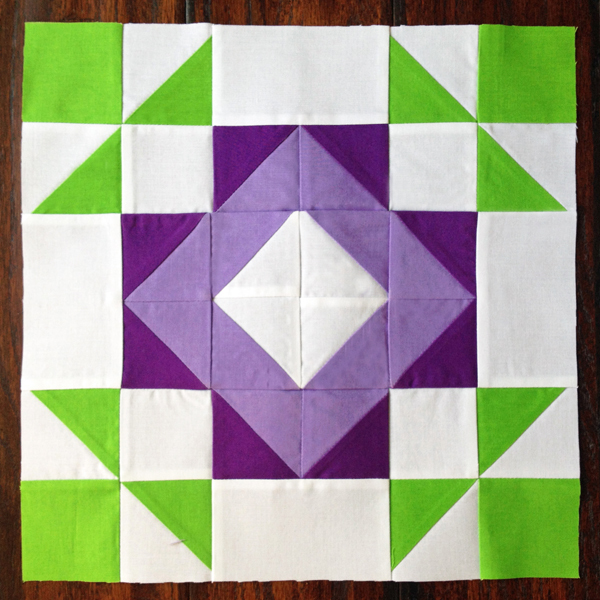 I am linking up today with Lee at Freshly Pieced and at Quilt Story. The trimming of HST certainly does make a difference but I agree that it's a tedious job. I like that you have kept your new block - it may be different but also a great block. i think your variation looks great! i also hate trimming HSTs but it's a necessary evil. Its amazing how much you can change something with just a little turn isnt it? both are wins! Definitely not fun trimming HSTs! I think your blocks look fab! I'm so glad you decided to leave your "mistake." It looks great! Gotta love happy accidents like that! I love your New Look block!! I'm not a fan of trimming either, I find good music or a fun audio book helps pass the time when trimming. I think you just designed a new block!